Natural building is the oldest way of building. Derived from the observation of nature and wildlife, we learned how to shelter ourselves by using natural materials found on the land. The oldest buildings known to man are made from natural materials. Only since the industrial revolution has natural building taken a back seat to what we now know as conventional building. The standardization of building materials in the early nineteenth century lead to natural building being viewed as substandard. Conventional building and natural building are fundamentally different. Conventional construction primarily uses manufactured building materials which often comes as low cost to the homeowner but high cost to the environment. Conversely, in natural building the majority of building materials are found on the land or nearby. Natural building material choices are low impact on the environment utilizing labor and skill to process raw materials into durable, healthy finishes. Natural building materials include stone, earth, clay, sand, straw, wood, and water. The purchasing of manufactured products is limited and salvaged quality materials is encouraged. The majority of the materials used in conventional building are standardized products that are not found on the property or elsewhere in nature. Today, there is a growing awareness of the impact that building methods have on the earth. The green building industry is trying to offer healthy alternatives to conventional building. Unfortunately, building with “green” materials can be cost prohibitive and often misses the point by shipping materials long distances. The green movement has introduced many wonderful products to the homeowner that in fact help decrease the destruction of the earth’s natural resources, but still stops short compared to natural building. Natural building encourages thoughtful protracted observation in design. Homes may harness the sun’s heat in the winter and provide protection from the sun in the summer. Most importantly, build the home to be your temple; in balance with nature, connected to the earth, and to house your inner spirit. The energy derived from building naturally with intention, cannot be put into words, it can only be experienced. Building with natural materials in this way creates a shelter that is healing to the mind, the body, and the spirit. Why build with earth and other natural materials? Health - Modern buildings are toxic to both builders and inhabitants, creating chemical sensitivities and other environmental illnesses. It is no surprise at this point that cancers and respiratory problems are linked directly to manufactured building products. This products affect the workers creating them, builders on the job site and the inhabitants of the finished structures. Clay is known in fact to be curative, a healing material that has long been valued for its ability to absorb toxins. Earthen structures breathe gently and slowly, absorb airborne toxins and soak up and regulate humidity or dryness. Psychological Well-Being - Highlighting the natural world in our buildings can stimulate our senses with the variety of patterns, shapes, textures, smells and sounds that our ancestors experiences with their building traditions. Studies have noted that right angles, flat surfaces, constant uniformity can actually trigger stress and nervous psychological responses. Empowerment - Financial empowerment can come by using local materials, by building smaller and smarter and by providing alternative means to labor. It is possible to build an affordable natural structure but if you are paying for the labor then the cost is equivalent to conventional building. Natural building also empowers individuals to learn these techniques to be able to build your own structures; to take back that power and right to construct your home. Supporting the industrial building industries plays a huge role in our environmental crisis; finding our power to source locally and sustainably will help in starting to make wiser decisions about how we engage with the world around us. Comfort - Thermal dynamics and indoor environmental quality is improved through natural building. Mechanical heating and cooling systems are expensive and can be toxic to our health. Earthen walls also provide great acoustics. Tradition & Heritage - Most of us have ancestors that lived in a natural structure. There are still forty thousand cob buildings in Devon, England, Australia with its heritage of cob and adobe and China with ninety million earthen buildings. It is our heritage and through natural building we can reconnect with our ancestors through our homes. Durability - Most conventional building materials have a shelf life. The modern house needs significant repairs within 30 years. 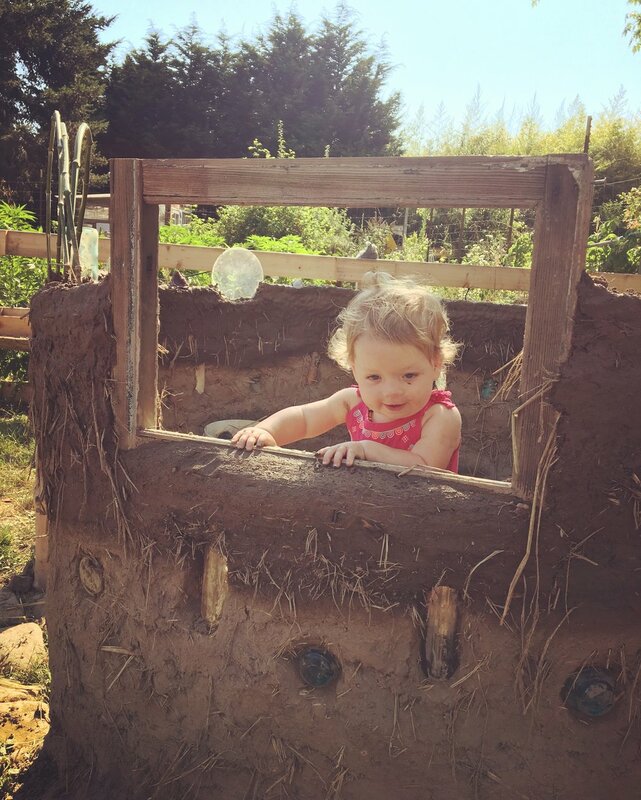 Well designed earthen and natural structures could last significantly longer. Not to mention the added bonus that when they are old and decrepit most if not all of their materials could be designed to decompose back into the earth. Environmental Impact - Building with more natural materials reduces the push for resource extraction and for industrial processing. It decreases pollution, deforestation, and energy use. The construction industry is a major cause of mining and industrial processing, with all their attendant pollution, ecological havoc, and social disruption. Although it is impossible to build a house with no environmental impact, it is our responsibility to minimize and localize the impact they have. Our team strives to create custom designs to meet the needs of the client, site, climate and available resources. These designs strive to minimize our environmental impact and educate folks about these important practices. What are differences between conventional & naturally built structures? The major difference between conventional and natural building is that we are building with materials that are typically in their natural or raw form. That comes with a variability factor. For example: soil dug from one location on the land will vary from another location. This will require testing to generate recipes for a cob mix or earthen plaster. Conventional building uses standardized products that have already completed testing to deliver the product to us. However, to keep those products standardized it comes with a price to our health and environment. Natural building is also dependant on the weather. An example would be how drying conditions have an effect on the timeframe of the project. It is important to know and understand that these variables are always changing. Builders and facilitators are always troubleshooting and working to come up with the best recipes for your climate specific, site specific and client specific design. Natural building mitigates our environmental impact by sourcing our materials as locally as possible in contrast to the conventional industries which build with materials brought a far distance to your structure. How does natural building compare to conventional building in terms of cost? Natural building can be comparable to conventional building in cost. In Nevada County, CA the average price of new construction is approximately $200-$400 per square foot. Our estimates based on current figures begin at $180 per square foot for the shell and between $200 to $350 per square foot depending on your finishes. Major benefits of natural building include; a healthy indoor environmental quality, the low environmental impact, supporting local mills, and supporting builders that construct with a conscious to take care of our planet and the inhabitants of the homes they build. We are artists, building one of a kind works of art, that you get the privilege of calling your home. The health of your family, the environment, and the people building it are all economic benefits that can’t be measured. However, the amount of savings on heating and cooling is something that can be measured. Well designed naturally built homes in California rarely rely on mechanical heating and cooling, saving the homeowner thousands of dollars annually. In California especially, wildfires are becoming more and more a part of our reality. Though it may seem counter intuitive; straw bale and round pole buildings have a class A 2 hour fire rating. With the addition of fire sprinkler systems and our attention to fire safety design we can provide you with a fire resistant home. These methods coupled with proper landscape design, utilizing defensible space can help mitigate costs to rebuild post wildfire.